Their contributions shouldn't be ignored. 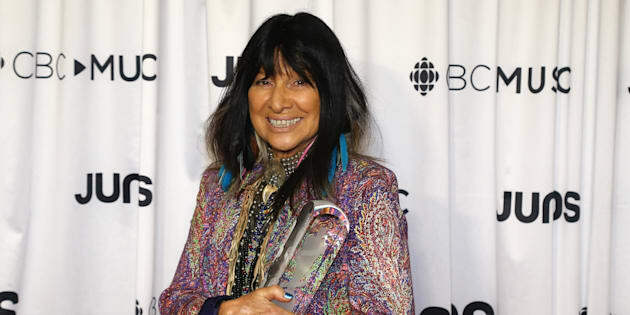 Buffy Sainte-Marie at the 2018 Juno Awards in Vancouver. The approximately 1.7 million Indigenous people living in Canada have endured unspeakable hardships over the past few hundred years — hardships often inflicted upon them with the end goal of eradicating their languages, cultures, religions, and even their very existence. Throughout that, Indigenous people have continued to contribute to Canadian society even when that society fought against their participation and inclusion. Their politicians and judges have changed our laws and justice systems, pushing them towards greater equality for all; their artists have enriched the cultural fabric and preserved traditions their people developed and preserved over hundreds, or even thousands, of years; and their activists have challenged everyone in this country to do better — work that continues today, with no less urgency or need. Sometimes, the Indigenous people taking these steps had to be the first to do so, cutting a trail for everyone who would follow them. These are just a few Indigenous "firsts" Canadians should learn about and celebrate. If you want to learn more, Sally Simpson of Wilfred Laurier University updates and maintains a list of female Indigenous firsts, now up to 92 entries. But get started with the stories of these seven trailblazers. Documentary filmmaker and activist Alanis Obomsawin became the first Indigenous filmmaker to have a film screened in the Toronto International Film Festivals' Masters programme in 2014. But her work has been influential for decades. Alanis Obomsawin at the 2014 Toronto International Film Festival. The 85-year-old made her first documentary for the National Film Board in 1975, and has since directed 50 NFB films. Obomsawin, a member of the Abenaki Nation, was among the first 35 people named to the inaugural Ordre des arts et des lettres du Québec in 2015, and also was the first person without an academic background in sociology or anthropology to be honoured with the Outstanding Contributions Award from the Canadian Sociology and Anthropology Association. She was also the first indigenous filmmaker to receive the Prix Albert-Tessier in 2016, Quebec's most prestigious film award. Once the dominant long-distance runner of his time, Tom Longboat was the first person of First Nations descent to win the Boston Marathon and remains one of two Indigenous North Americans who have ever won. Born on the Six Nations Reserve in Ontario in 1887, Longboat won the Boston Marathon in 1907, setting a record for the time. Along with several other runners, Longboat passed out during his race at the 1908 Olympics but won a make-up race arranged at a later date. He continued to race professionally while serving in the First World War. In 2012, Kateri Tekakwitha became the first Indigenous person from North America to be canonized as a Catholic saint, by then-Pope Benedict. Tekakwitha, who was orphaned by smallpox as a child and died in 1680 at age 24, was converted to Catholicism by missionaries. She is now the patron saint of the environment and Indigenous people, and two Quebecois churches are named for her. But while many celebrated her sainthood, for others her life is a reminder of the legacy of colonialism. Born in Red Sucker Lake, Man. in 1949, Elijah Harper became the first Treaty Indian elected as a provincial politician when he won the Manitoba riding of Rupertsland for the NDP in 1981. He served in the cabinet in several different roles during his 12 years in provincial politics, but is perhaps best known for his refusal to accept the Meech Lake Accord in 1990. Unhappy the accord was negotiated without First Nations input, Harper held a filibuster against the vote, while holding an eagle feather, that eventually led to its failure. Harper died in 2013 at the age of 64. Considered the driving force of the "Indian Group of Seven," Ontario-born Daphne Odjig had a few Canadian art-world firsts to her name. In 1973 she founded the Professional Native Indian Artists Inc. (also known as the "Indian Group of Seven") along with Alex Janvier, Jackson Beardy, Eddy Cobiness, Norval Morrisseau, Carl Ray, and Joseph Sanchez, broadening the reach of First Nations art in Canada. The next year she and her husband opened Canada's first Indigenous-owned and operated art gallery, New Warehouse Gallery, which was also the country's first gallery exclusively representing First Nations art. Born in Manitoba on the former St. Peter's Indian Reserve, Murray Sinclair's long career in law and politics has involved several prominent roles, including as the chair of the Indian Residential Schools Truth and Reconciliation Commission. The current senator was the first Indigenous judge to be appointed in Manitoba, in 1988, and the first Indigenous person appointed a judge on the Court of Queen's Bench of Manitoba, in 2001. The Cree musician, born in Saskatchewan, has been a trailblazer in many ways over the course of her long career. A self-taught musician, Buffy Sainte-Marie has been recording and touring since the early 1960s, despite being blacklisted by commercial radio for her politically charged songs. Her late-1960s album Illuminations was the first totally quadraphonic electronic vocal album ever recorded. In one of many appearances on "Sesame Street" in the 1970s, she nursed her son in what is believed to be the first representation of breastfeeding aired on TV. She still records and performs, and won the Polaris Prize in 2015.